Why did the feds raid Celerity charter, and what’s next? Grace Canada, CEO of Celerity. Seven federal agencies united in a raid Wednesday in Los Angeles of a charter school network that oversees high-performing schools but had come under scrutiny for its financial and management practices. The raid of Celerity Educational Group, first reported by the Los Angeles Times, came after an investigation by LA Unified’s own Office of Inspector General as well as reports by the district’s charter schools division concerning fraud, fiscal mismanagement and misuse of public money meant for schoolchildren. The concerns date back to 2015 but shot into the open at a contentious school board meeting in October when two Celerity schools were denied renewal. A major issue cited at that meeting by LA Unified Charter Division Director José Cole-Gutiérrez was an umbrella nonprofit corporation, Celebrity Global Development, that had been added to the bylaws of Celerity Educational Group and had major oversight of the schools. Those concerns and an internal LA Unified investigation led to search warrants served Wednesday at several locations of Celerity administrative offices, though not at any school sites. The agencies included the Office of the Inspector General for the U.S. Department of Education, the FBI, the U.S. Postal Inspection Service, the Department of Homeland Security, U.S. Immigration and Customs Enforcement, the Secret Service, IRS Criminal Investigation and LA Unified’s Office of Inspector General, said Thom Mrozek, a spokesperson for the U.S. attorney’s office in Los Angeles. He added that the search warrants are under seal and he couldn’t speak to the scope or nature of the investigation. The confiscation of computers and documents did not occur at any of Celerity’s seven LA-area school sites. Six are in LA Unified, and all are located on campuses they share with district schools. All six are also split across more than one location, with two of the schools each holding classes at three different sites. A seventh school is in Compton. Celerity had operated a school in Pasadena, but the fire marshal shut it down in 2014. Paul Girard’s children attend Celerity Troika. Celerity’s schools are expected to remain open during the federal investigation, an LA Unified spokeswoman said, and that could take months or even years. But the two schools that were denied renewal in October face possible closure at the end of the school year. The spokeswoman said LA Unified would have no further comment. One Celerity parent said Thursday morning that families had not yet been notified, although a letter later was sent. “When I dropped the boys off today everything was fine, the children don’t know what is going on,” said Paul Girard, whose twin boys are in first grade at Celerity Troika in Eagle Rock, which was denied renewal by the school board in October along with Celerity Dyad in South Los Angeles. He said a flyer explaining the situation went home Thursday. 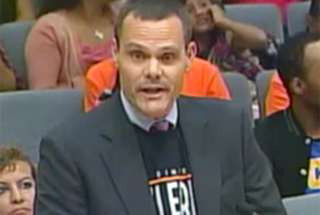 Celerity appealed the school district’s decision to the Los Angeles County Office of Education, but the county didn’t act on the appeal. The schools were planning to seek state Board of Education approval in May, according to Girard. The state approved an appeal of two new charter schools for Celerity after LA Unified denied them last year. The two schools’ achievement levels led to the protracted discussion at the October board meeting, as board members sought to understand why they had been recommended for denial. 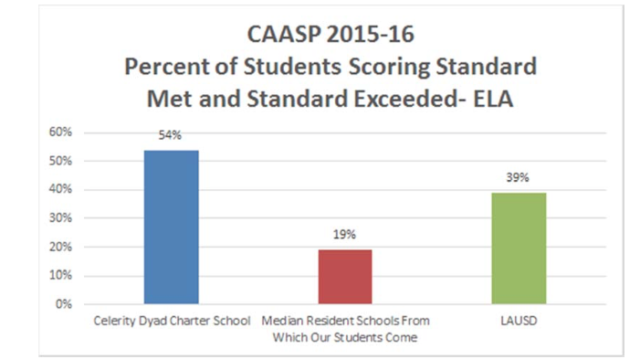 According to statistics presented by Celerity and confirmed by the district, the Dyad and Troika schools had test scores higher than the neighborhood district schools in both English and math. Their scores also improved between 2015 and 2016. More significantly, they had higher scores than the district for minority students, English learners and socio-economically disadvantaged students. They were both also named California Distinguished Schools, awarded to schools that have demonstrated significant gains in narrowing the achievement gap. Dyad has an 81 percent Latino and black population with 69 percent of students low-income, and Troika has a 99 percent Latino and black population with 96 percent low-income. 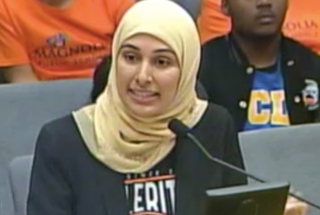 “We serve high-need students and have among the strongest academic record in the state,” Nadia Shaiq, the Celerity educational group director of school services who joined the organization in 2006, said at the October meeting. He said that CEG, not Global, must comply with the public records act and other state transparency laws. LA Unified officials said the bylaws were changed to include Global without telling the district and that Global had veto power and oversight of the charter school board members. As recently as Sept. 7, the district had asked for a list of board members of Global but had not yet received it, Perry said at the October meeting. School board President Steve Zimmer noted at the meeting that Celerity had had a year and a half to deal with the district’s questions. Board member Mónica Ratliff said at the meeting that said her biggest concern was the lack of transparency because of the change of the bylaws, and that is why she voted against the Celerity renewals. The vote was six against the renewals of the schools, with Rodriguez abstaining. Celerity executives, including Canada and founder Vielka McFarlane, donated to García’s upcoming election campaign. About $3,800 in donations came from Celerity employees for García’s campaign. Board member Rodriguez, who was on the same panel as Caputo-Pearl, was asked about his vote to abstain in the Celerity decision in October. 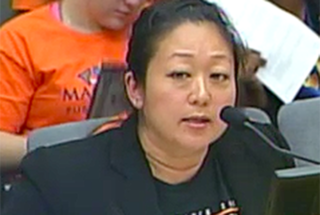 “That was a difficult situation because they were in my board district. … Those schools are high performing, but I also suggested there be an opportunity for the schools to break away from their mother organization as a way of keeping those schools alive,” he said. He said the district staff had proposed that to Celerity, but the organization declined to do so. He said he abstained because he thought they could have worked a separation out. “I also turned around and said, ‘Charters, you’ve got to be good partners in this,'” he said Thursday. Celerity Schools opened its first charter in 2005, in Los Angeles, and now operates seven schools in the LA area. It also operates four schools in Louisiana, though they are not listed on Celerity’s website. Celerity was also in the process taking over a failing school in Nevada, but that state’s Department of Education pulled the application in light of Wednesday’s raid. Celerity’s website states that it operates 26 schools, but none besides the 11 in LA and Louisiana could be verified. As of October, Celerity indicated it had expanded to Ohio and Florida and displayed those states on its website, but now none are listed among those states’ charter schools. Celerity’s first school to open in Ohio closed two years later, in 2015, never reaching its goal of serving students in grades K-8. Celerity Tenacia opened in an office building near a water park in Columbus in 2013. The school was paying rent to the parent company, according to an investigation by the Akron Beacon Journal. *This article has been updated to add reaction from Ref Rodriguez and Alex Caputo-Pearl, to add that Celerity sent parents a letter Thursday, and to correct that Celerity did not end up taking over a Compton school through a parent trigger but instead moved to a different location. One of the charts presented by LAUSD that shows Celerity exceeding state and neighboring schools.